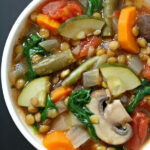 Easy Lentil Vegetable Soup that's cozy, warming, and nutrient-packed! Only 10 ingredients and super customizable. Other additions: spinach, broccoli, kale, corn, peas, cauliflower, cabbage, etc. In a stockpot over medium-high heat, add onion and carrot with salt. Sauté for about 8 minutes. Meanwhile, mince garlic, dice zucchini, and slice mushrooms. When onion is translucent, add garlic, zucchini, mushrooms, and basil. Stir and cook for 2 minutes. Add diced tomatoes with juice and vegetable broth. Add green beans and lentils. Reduce heat, cover, and lightly simmer for 25-30 minutes or until lentils are tender, adding more broth or water if needed. Salt to taste. Optional (but recommended): stir in a few handfuls of baby spinach during the last couple minutes of cooking.